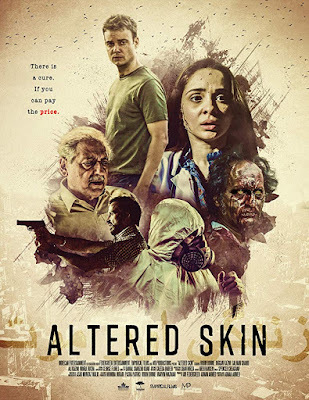 ALTERED SKIN is the outbreak/zombie movie that I’ve been waiting to see for a while but didn't know it. In a genre where we have sensationalistic monstrous killers that move like lightning and take over the world, here we have an illness that is quietly destroying lives and slowly breeding fear. The film is about Craig Evans an American ex-pat living in Pakistan. His wife is a doctor who contracts the MN-2 virus from a patient who has a sudden violent outburst. The virus slowly takes over the patient causing madness and violent outbursts. There is a medicine that will stave off the effects but it isn’t a cure. The virus can be slowed if the victim is put into a coma which is what happens to Craig's wife. Craig is contacted by the wife of an investigative journalist who was found dead. She asks him to continue her husband’s investigation because as an American he has greater freedom than any Pakistani. He begins following the clues and discovers links to a pharmaceutical company. Wonderfully low key and slow burn this is almost the exact opposite of your current typical outbreak/zombie film. This is a film about people trying to find out the course of a disease. We have real characters here not types. People talk to each other like real people and not in movie speak. It all feels wonderfully real. The situations are not contrived movie plotting but reasonably realistic ones. Basically this is a thriller for adults and I loved it. I suspect that those wanting a balls to the wall flesh ripping story are going to be disappointed. This is not that film. This is a film that is about people not effects or gore. Yes, the effects are chilling, The milky white eyes bloody ooze and distorted features we see on some of the victims is truly terrifying because it’s not over done and not constant. We see it here and there with result it breeds fear because we are not used to it. We notice any decay, or any sign of how long they have been changed and it scares us. Mostly though this is a tale of people. Specifically it is about Craig and the people he meets. The collection of doctors, police, patients and others feel real. These are people we could meet in real life. Their lives carry weight and we can imagine them going through their paces off screen. That any film manages to give everyone seeming full live is rare, however in a horror film it’s rarer. ALTERED SKIN is a masterpiece. It is unlike almost any other horror film you will run across. The closest film I could compare it to is the zombie film MAGGIE which is about a family dealing with one of their own turning. (I want to say Steven Soderbergh's CONTAGION but that film has isn’t as low key). It is both chilling and thoughtful. How good is the film? I got yelled at for not turning off the film at work after lunch when I kept watching because I HAD to see how it came out. Yea. It’s that good. Its one of the best horror films I’ve seen in 2018 and certain to end up on one of my year end lists. This is a must see when it plays Friday at The Blood in The Snow Film Festival.